Looks nice…but my cat doesn’t like it! I assume she will destroy the beautiful bronzed screen. May have to put in a thin clear acrylic in the lower parts. I live in a California Style Bungalow and they look great in my home. 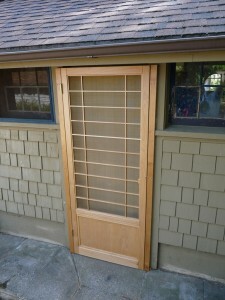 Next up for my house is a pair of narrow shoji to replace the French doors in my office. This door is now available as a kit for $1500. 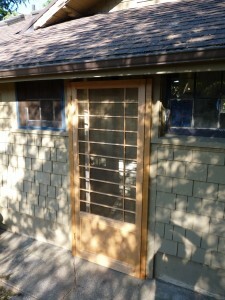 This includes the jambs, finish, hinges, and the screen installed. I can do this for $150 less if you want to finish it your self. The price includes a crate. You pay whatever the shipping is via Pilot Freight. probably around $220-275 to the major cities airports. Home delivery probably about $50-60 more. I can ship this to NYC address for $250 and that is delivered and insured. A Minor Mishap in the Shop Parking Lot.